The Cross Base from Team Sport Banner is made out of sturdy and long-lasting double chromed-steel. It is very easy to assemble, disassemble and even to transport. 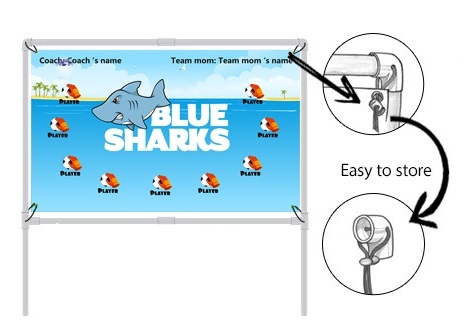 You can use it to showcase your banners and it is excellent for outdoor and indoor use. Made from the combination of fibre glass and aluminium pole, the feather poles are flexible enough to give your flags unique shape. Together with the two aluminium poles at the bottom, strength and durability to your pole will be added to your pole. If you have an econo flag then the Econo Flag Lightweight Aluminum pole set is perfect for you. The curved sleeve and free-flying edge allows the flag to grab attention without wrapping around the pole and assembly is easy. Do you want to showcase your flag? If you do then you should have a ground spike to plant your flag securely on the ground. The ground spike of Sports Banner is made out of steel with a Zinc coated surface and it is very durable and easy to use. Functions the same way as the ground spike does but works perfectly for econo flag. Bears the same characteristic as the ground spike where it is made made out of steel with a powder coated surface and they are antirust so even if you plant it on the ground rain or shine, expect that the spike wont rust or change. Made out of iron with a powder coated surface, the square base is also antirust and perfect whether for outdoor or indoor use. Keep your stand safe by keeping it in a durable bag. Made with pvc coated nylon pack cloth with Velcro closure, the stand tote bag will make it easy for you to load and unload your banner and stand quickly. Make transporting your flags, pole and base options easier with the use of the carrying bag. It will also organize all your accessories in one bag so you can grab it anytime during the game. It also has an adjustable shoulder strap and two handles on the side of carrying bag making it easy to carry. You sure don’t want to see your flag moving every time the wind blows, the solution for that kind of situation is a water bag, just simply fill it with water and it can add additional weight to your flag keeping it steady in one place. It is very easy to use and setup and works perfectly well in outdoor and indoor settings.